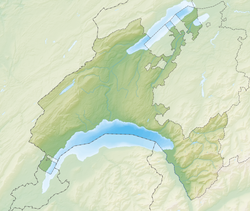 Yverdon-les-Bains (French pronunciation: ​[ivɛʁdɔ̃lebɛ̃]) (cried Eburodunum an Ebredunum during the Roman era) is a municipality in the destrict o Jura-Nord vaudois o the canton o Vaud in Swisserland. ↑ 4.0 4.1 4.2 4.3 4.4 4.5 Conseil des Communes et Regions d'Europe (in French) accessed 27 April 2011. This page wis last eeditit on 8 Mairch 2018, at 05:39.